(CNN) -- Now that Republicans have won control of the Senate, Washington is awash with rumors and speculation about how President Barack Obama and the GOP Congress will get along. Armchair Dr. Phils are already yakking about how the two sides should just get along "for the sake of the children...er, country." But this is not a troubled marriage. It's more complicated than even that. Rather than look to the psychobabble of self-help, we should look at the hard-earned successes of difficult peace negotiations between nations. 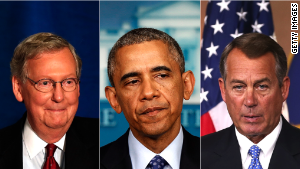 President Obama, House Speaker John Boehner and presumptive Senate Majority Leader Mitch McConnell should begin with what peace negotiators call "Confidence Building Measures." CBM's between nation begin with cultural exchanges -- like sending American ping-pong players to China. This is why a bourbon summit would be useful, and I hope Sen. McConnell takes the President up on his offer. But once you've broken the ice by breaking out the bourbon, where do you go? What issues do you start negotiating? 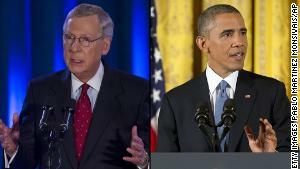 It is a troubling sign that, in their post-election press conferences, both Obama and McConnell kept circling back to immigration. At one level this is obvious: Immigration is an important national priority on which the two parties seem deeply divided. That's why they should not start with immigration. Instead they should start small. The NIH has been in the news recently, since its director, Dr. Francis Collins, said we would already have an Ebola vaccine but for budget cuts. It is simply true that, after the Clinton-Gingrich-Bush increase, NIH funding has flat-lined. In fact, NIH has lost 25% of its purchasing power, due to budget constraints and the moronic policy sequester. Smerconish: Can't we all just get along? Boosting NIH would be good for the economy. A $3 billion investment championed by Democratic Sen. Tom Harkin and signed into law by President George H.W. Bush paid for the research that decoded the human genome. That $3 billion investment has spurred -- get this -- $965 billion in economic activity, including 53,000 new jobs and $290 billion in personal income, according to a study by the Battelle Technology Partnership Practice for United for Medical Research, a coalition of research institutions, patient and health advocates and private industry. Boosting NIH is also good politics. I am on the Board of Visitors of MD Anderson Cancer Center in Houston. MD Anderson is the number-one recipient of research grants from the National Cancer Institute, which is part of NIH. And you know which senators have MD Anderson in their state? You got it: Ted Cruz and John Cornyn. One a tea party favorite and one a Chamber of Commerce hero. If they would get on board with boosting NIH funding, a whole lot of their constituents on both sides of the aisle would be happy. Championing biomedical research did not dent Newt Gingrich's conservative credentials, nor did it hurt Bill Clinton among liberals. Because cancer knows no partisan boundaries. One in two American men will develop cancer. One in two. And one in three American women will. If you're reading this at the office (I promise not to tell) look around: Half the guys and a third of the women will, one day, sit in an office and hear a doc say, "You have cancer." Think about that as you have dinner with your family, when you're at a football game this weekend or in church this Sunday. President Obama lost his mother and grandmother to cancer. 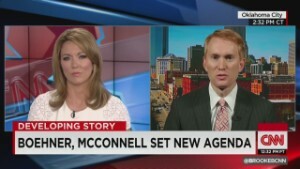 Mitch McConnell beat polio. Each of them know the pain of loss and the promise of biomedical research. So my advice to them is to start with the basics: basic science, and then work their way up to the more intractable problems.